Private First Class Milburn H Henke from Hutchinson, Minnesota was officially the first American GI to step into the European Theatre of Operations in 1942. Private First Class Milburn H Henke of Hutchinson, Minnesota went down in World War Two history as the first American GI to set foot in the European Theatre of Operations when he disembarked in Belfast, Co. Antrim. Private First Class Milburn H Henke served in the United States Army during World War Two. 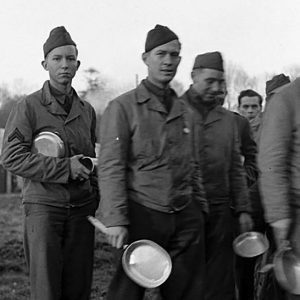 The young American was part of Company B, 1st Battalion, 133rd Infantry Regiment, 34th Infantry (Red Bulls) Division. 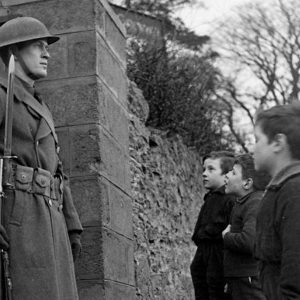 Official documentation lists him as the first American GI to set foot on European soil in the Second World War. Born on 24th August 1918, he was the son of Carl Henke and Louise Henke, a farming family from McLeod County, Minnesota. They moved to Hutchinson, Minnesota in 1921. As a young man, Milburn enjoyed baseball, reading, hunting, and fishing. He worked for his father at Henke’s Café in Hutchinson. He enlisted on 21st September 1940 to beat the draft. On 10th October 1941, Henke’s 135th Regiment merged with the Iowa National Guard 133rd Regiment. In a little over a month after the attack at Pearl Harbor, the men were bound for the European Theatre of Operations. Milburn H Henke landed ashore at Dufferin Dock, Belfast, Co. Antrim on 26th January 1942. He descended the gangplank from a British tender that had brought troops to the docks from the converted liner HMTS Strathaird. In truth, around 500 American troops had already disembarked. Henke repeated the famous step six times enabling photographers to get the perfect photo. Imperial War Museum Photo: H 16847 (Part of the War Office Second World War Official Collection). 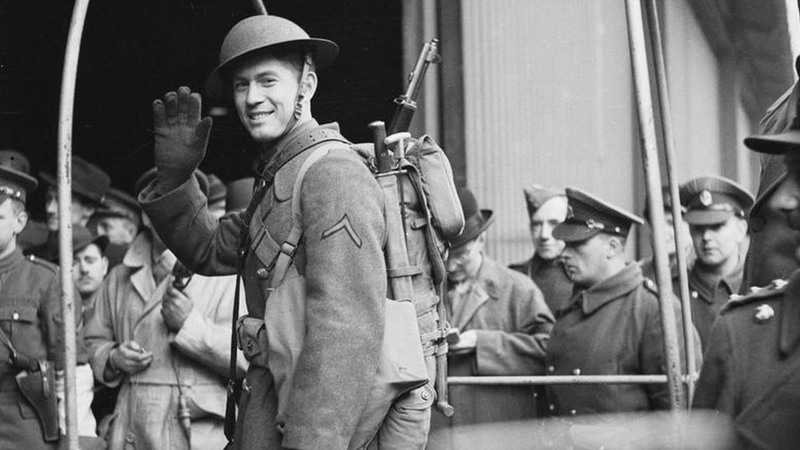 Private Milburn Henke, presented to the press as the 'first' United States soldier to land in Northern Ireland, arrives at Dufferin Quay, Belfast. 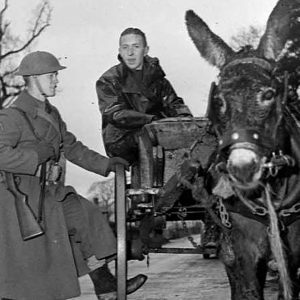 Photo taken on 26th January 1942 by Lieutenant Bainbridge - Official War Office Photographer. GIs formed along the docks from USS Chateau Thierry, the Strathaird, the Canterbury, the Princess Maud, the Maid of New Orleans, and the Royal Daffodil. These men had been at sea since departing from Brooklyn, New York on 15th January 1942. Henke was with his company when a Colonel asked for a volunteer. Henke’s Lieutenant put his name forward and the Private expected he was going ashore to unload equipment. Rather than offloading gear, he met with Major General Russell P Hartle, commanding officer of 34th Infantry Division. There was some surprise when Hartle discovered the first soldier ashore was from Minnesota rather than his home state of Iowa. 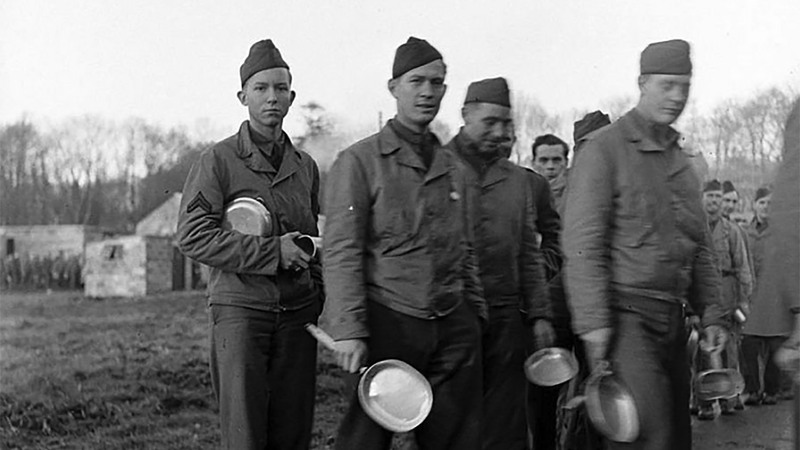 Henke was a typical United States doughboy, with an easygoing nature and good looks. However, there was some irony over the first American GI in Europe having a German surname. An official welcoming ceremony took place after the band of the Royal Ulster Rifles played the Star-Spangled Banner. 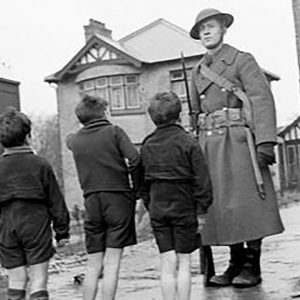 Sir Archibald Sinclair – Secretary of State for Air, the Duke of Abercorn – Governor of Northern Ireland, and John Andrews – Prime Minister of Northern Ireland welcomed the American Private. Like the other GIs of the first contingent of MAGNET Force, Henke sported an M1918 helmet and carried a M1903 Springfield rifle. He wore a military jacket and tie. He spoke with British, Irish, and American reporters giving radio interviews. His name and face were all over the national news back home in the United States of America. The press focussed on the love story between Milburn H Henke and his girlfriend Iola Christensen in Minnesota. She also gave a radio interview broadcast in Britain and America in which she swore to wait for his return. Radio stations also staged a telephone call between Henke and his parents in America. While he seemed to enjoy the celebrity status, reports suggest his fame may have contributed to the rejection of his request to join the US Rangers. With all the attention I got, it looked as though the Army’s plan was for me to win the war single-handed. Henke became something of a celebrity on his arrival in Belfast. He met with Queen Elizabeth and Eleanor Roosevelt during his time in the United Kingdom. Artist William Conor received a commission to illustrate the moment. He completed 24″ x 19″ crayon illustration on 23rd March 1942. The United States Army purchased the work a year later but its whereabouts since are unknown. An article in After The Battle magazine from 1981 by Ian Henderson showed photos of Henke in Conor’s studio. David Hale from Washington, DC had found these pictures, which then made their way to the Arts Council of Northern Ireland. These photos may be the only surviving records of William Conor’s work. 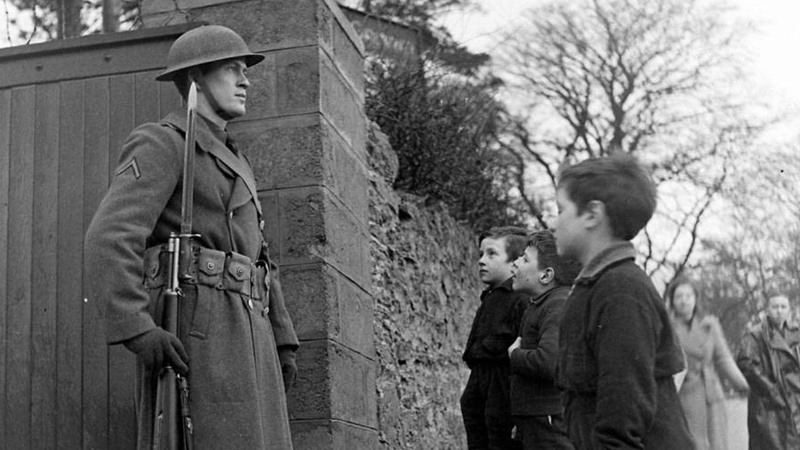 A stone monument stands outside Belfast City Hall commemorating the arrival of the American GIs on 24th January 1942. Photo taken on 15th April 2016. 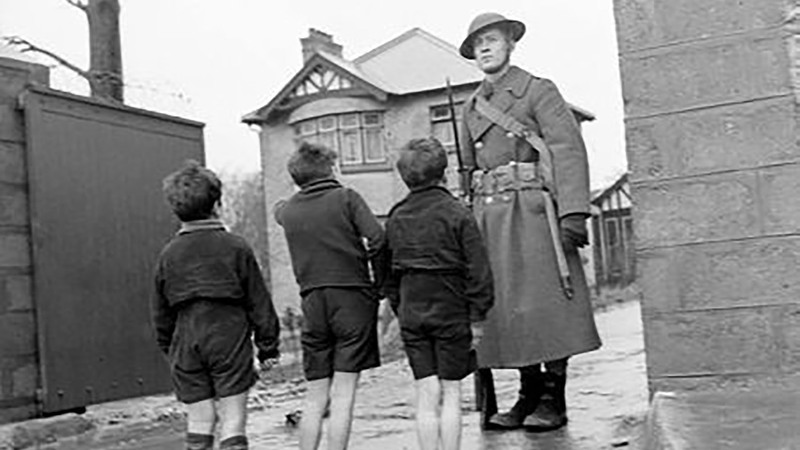 Copyright Scott Edgar - World War Two Northern Ireland. 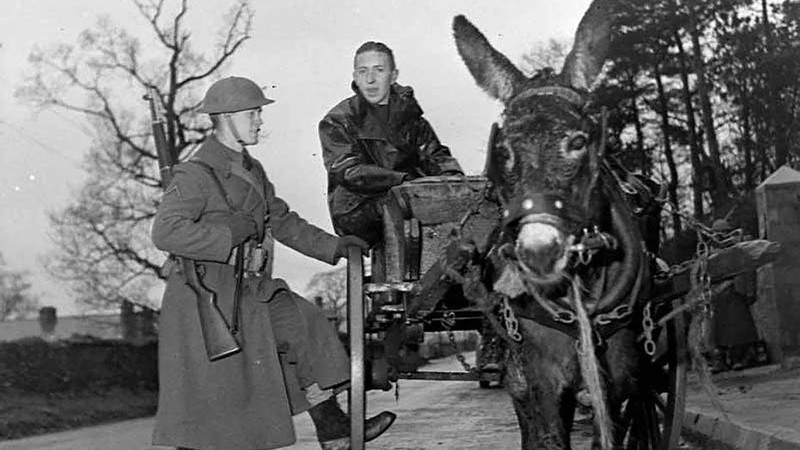 Henke spent 9 months in the United Kingdom before landing with 34th Infantry (Red Bulls) Division in North Africa. The Division would help liberate Tunisia from Axis control. 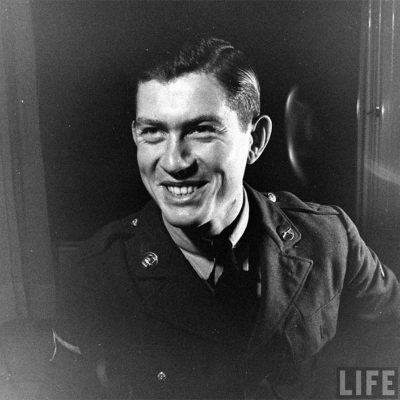 As part of Operation Torch, he received the Silver Star for crawling through gunfire to save the life of Lieutenant Springer. He tied a piece of his coat around the injured officer’s leg to stem the bleeding before dragging him to safety. Later during the Second World War, he suffered a broken back when a weapons carrier Jeep overturned. He spent 4 months in military hospitals in Oran and Algiers in Algeria, North Africa. After this, he returned to Minnesota on leave, proposing to Christensen on his arrival. She accepted, they married on 20th August 1944 and the couple spent the rest of the war together in the United States of America. Henke served a final year in the Army based in Texas and Georgia. Milburn and Iola returned to Hutchinson where they raised 3 children and took over running Henke’s Café. The couple remained married until Henke’s death on 26th April 1998. I was just sort of picked out of a hat. But I never tried to downgrade what it meant: the symbol of America sending its boys to Europe to help win the war. Private First Class Henke returned to Northern Ireland in 1992 to mark the 50th anniversary of his famous landing. He had also been present for a 25th anniversary event. Of 4,058 men who landed with Henke, only 7 remained in 1st Battalion in 1945. Henke felt he received undeserved attention and was no national hero when so many of his comrades had died. 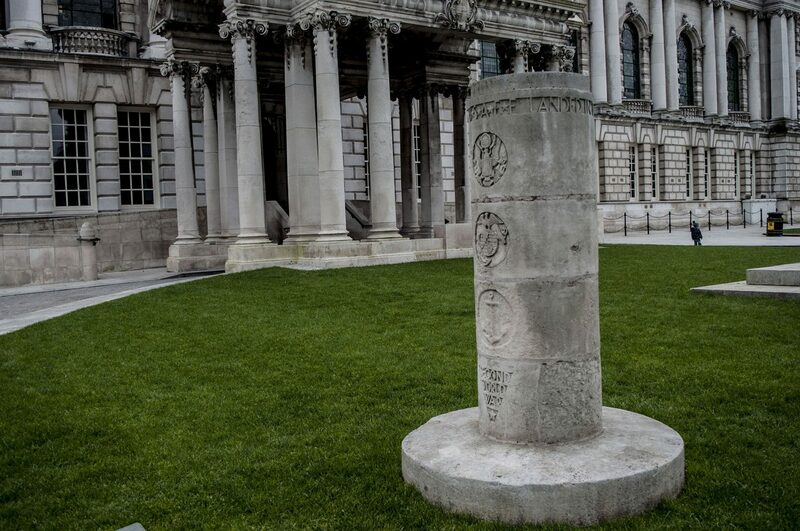 He further attended a rededication of the Memorial to US Troops at Belfast City Hall, Belfast, Co. Antrim on 14th September 1994. He read a letter from the Major General David H Lee, commander of 34th Infantry Division and one from the Governor of Minnesota. The Lord Mayor of Belfast and the city chaplain Dean Shearer stood next to Henke as he read. Milburn H Henke was a member of the American Legion, Veterans of Foreign Wars, Disabled American Veterans, and helped with the Special Olympics. His grave is in the Peace Cemetery, Ruthon, Minnesota near several other American GIs who descended that same gangplank in Belfast on 26th January 1942. If you enjoyed this post on "Milburn H Henke", please share with your friends and followers.